I have loved the beauty industry my whole life. As a kid I began cutting my barbies hair and then as a teenager I practiced on my friends hair, much to their dismay. Throughout High School I worked as a receptionist in a salon and probably drove the stylists crazy since I asked so many questions. This confirmed my decision to be part of this industry. 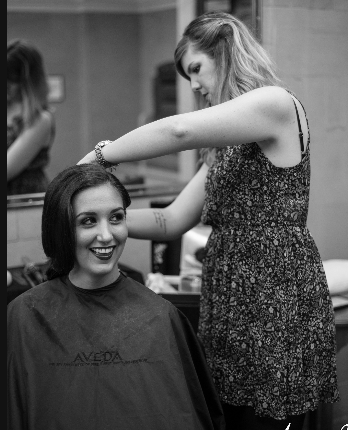 After high school I attended The Aveda Institute in Chicago and graduated in 2004. After graduating, I started an assistant program at Siren Salon in Chicago. I learned so much from this program, the salon, and from the continuing education I received there. I got to participate in salon workshops, photo shoots, and classes during my 7+ years at this salon. I was also lucky enough to attend the Bumble & Bumble University in New York City for a two day workshop. I still love to learn the newest techniques and products to keep me up to date with the latest trends and styles. My specialities include highlights, balayage, ombré, gray coverage, women's cuts, men's cuts, blow dry styles, make up and special occasion styles. I came to a point in my career where I wanted to learn more of the business side of the salon world. I became the salon manager at a beautiful salon in Roscoe Village. It was a very challenging job, but I loved teaching the other stylists as well as organizing, budgeting, and helping the salon thrive. At this time I was also a freelance hairstylist on my days off, going to my clients houses to perform services. I missed doing hair on a regular basis, but I really enjoyed being part of the business side. I came to the conclusion of being an independent hair stylist and chair renter. This would enable me to enjoy the best of both worlds. So I took the plunge and started renting a chair at The Colour Room in July 2014. As of February 2016 Itook another career plunge and started renting my own salon suite at Sola Salon Studios Chicago. I couldn't be happier with the direction my career had taken. I am excited to keep learning and to keep growing my own business.